Iceland will welcome Switzerland to Reykjavik for their UEFA Nations League encounter on Monday, having lost the reverse fixture 6-0 last month. Iceland and Switzerland are set to lock horns for the second time in the UEFA Nations League A Group 2, at the Laugardalsvollur on Monday night. The last time these two sides met in September, Switzerland thrashed Iceland brutally, beating them 6-0. However, after that game, the Nati have been handed two defeats in a row – a 1-0 loss against England, which was followed by a 2-1 defeat to Belgium earlier this week. And manager Vladimir Petkovic will be aiming to get his team back on winning ways on Monday. Should Switzerland manage to claim all three points against Iceland, they have a chance of jumping to the top of Group 2, ahead of Belgium on goal difference. Iceland, after their disastrous loss against Switzerland last month, were beaten 3-0 by Belgium and are rooted to the bottom of Group 2 with no points. However, Erik Hamren’s men almost pulled off a huge upset against World Champions France in a friendly encounter earlier this week, taking a 2-0 lead, only to see Les Bleus come back in the last five minutes of the match and draw the game. A defeat on Monday would mean relegation to League B for Iceland. But, they can draw plenty of confidence from their performance against the World Cup holders as they look to exact revenge for their heavy defeat at the hands of the Swiss last month. Jon Dadi Bodvarsson has been ruled out for Iceland due to injury, while captain Aron Gunnarsson remains a doubt due to lack of fitness. 21-year old Albert Gudmundsson has been called up to the international squad, while 19-year old Jon Dagur Thorsteinsson has also earned a place in the roster for the first time ever. Hamren is unlikely to change the 4-4-1-1 formation that he used in the previous game, but there will be a few alternations to the starting XI on Monday night. Regular goalkeeper Hannes Halldorsson should return to the team, after Runar Runarsson started against the French. Birkir Saevarsson will start on the right side of the back four for the home side in place of Holmar Eyjolfsson with Hordur Magnusson coming in at left-back. Ragnar Sigurdsson and Sverrir Ingason should start in the heart of the defence with goalscorer in the last game Kari Arnason dropping out. Johann Berg Gudmundsson should be retained on the right side of the four-man midfield, while Ari Skulason could come in to replace Arnor Traustason on the left flank. Aston Villa midfielder Birkir Bjarnason will get another opportunity in the middle of the park, alongside Runar Sigurjonsson, meaning there’s no place once again for Emil Hallfredsson. Gylfi Sigurdsson has been in fine form of late and should continue in the hole behind the main striker Alfred Finnbogason, who has also been in good nick for German club Augsburg. The Nati were already without the services of Admir Mehmedi, Kevin Mbabu and Johan Djourou due to injuries. They have now been hit with further problems as Breel Embolo and Roman Burki have also withdrawn from the squad. Veteran defender Stephan Lichtsteiner did not make the cut for the squad, owing to his lack of playing time at Arsenal. Petkovic fielded his team in a 3-5-1-1 formation against Belgium earlier this week, but is very much likely to return to the tried and tested 4-2-3-1 setup against Iceland on Monday. Yann Sommer is a guaranteed starter between the sticks for the Nati. Screening his goal will be a back four comprising of Michael Lang and Ricardo Rodriguez as the full-backs on the right and left sides respectively, while Fabian Schar and Manuel Akanji should start at the heart of the defence, with Nico Elvedi dropping out. Arsenal midfielder Granit Xhaka will take up the playmaking duties from a deeper role in the middle of the park and will be supported by the young Denis Zakaria, who was very impressive in the win against Iceland last month. Attacking threat from the wide areas will come from Steven Zuber on the left flank while on the right side BSC Young Boys’ Christian Fassnacht could get a look in. Star man Xherdan Shaqiri will look to pull the strings from the No. 10 role, with Mario Gavranovic, who scored against Belgium in Brussels this week, expected to spearhead the attack. Iceland have been without a victory in their previous twelve games. Their last win came back in October last year – a 2-0 triumph over Kosovo. Switzerland have won just two of their last seven fixtures (D2, L3). However, the Swiss are unbeaten against Iceland in all their seven fixtures so far, winning six of those. In their past seven meetings against Iceland, Switzerland have scored a total of 19 goals, while conceding only five times. They have managed to keep five clean sheets in these fixtures. After a disappointing 2017-18 campaign at Everton, following his record move from Swansea City, the 29-year-old seems to have found his mojo back in the ongoing season. Sigurdsson has bagged five goals and set up one more in nine appearances across all competitions for the Toffees already this term. 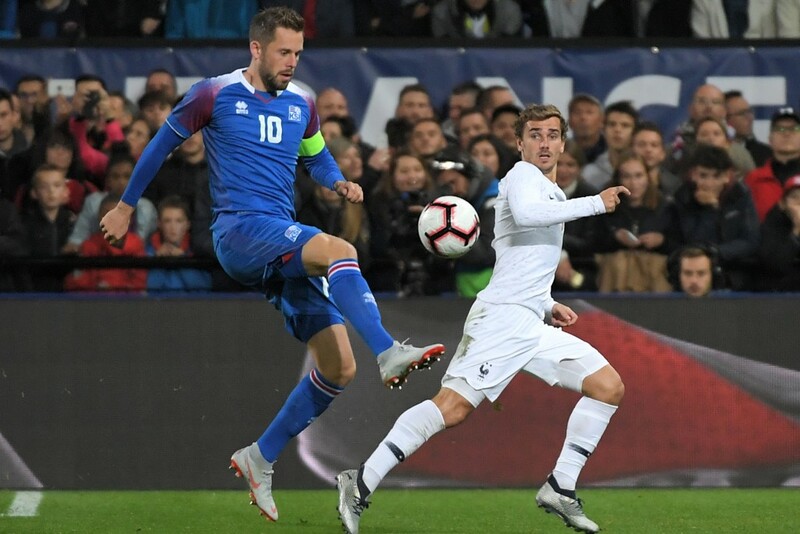 The 29-year-old was in his elements in the draw against France earlier in the week, as he assisted Arnason’s goal in the second period. If Iceland are to have any chance of coming out on top against Switzerland on Monday night, they will need their talismanic playmaker to be firing on all cylinders. Iceland face a do or die situation heading into the Monday night’s fixture against Switzerland. While they have often shown that they can punch well above their weights and were quite impressive against France, the implosion towards the end of the game highlighted their defensive vulnerability. Switzerland, on the other hand, haven’t been able to pick up a victory since they mauled Iceland last month, but there were a lot of encouraging signs in their performance against Belgium earlier this week. Considering their exceptional record against Strakarnir okkar and the outcome of the last game, we at the Hard Tackle expect the Swiss to come out on top once again.